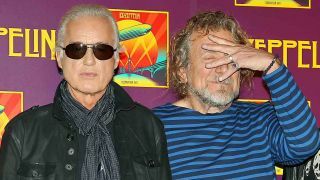 It's the trial that just won't end: just over a month since the jury in the Stairway To Heaven trial found in favour of Led Zeppelin, the claimants are now seeking an appeal against the original ruling. According to Courthouse News, Michael Skidmore - a trustee for the late Spirit guitarist and songwriter Randy Wolfe (AKA Randy California), whose song Taurus is claimed to have been partly lifted by Zep - filed the appeal on 23 July. This comes after the jury deliberated for just five hours before unanimously deciding in favour of Led Zeppelin last month. Guitarist Jimmy Page recently responded to the trial's outcome on Facebook, stating: "I have received and been aware of the overwhelming wave of support, encouragement, and congratulations that has been deeply moving. "I'd like to take this opportunity to personally thank all those who contributed such a positive energy to me." In the trial, Skidmore claimed Stairway To Heaven had earned the band tens of millions, although Page and Robert Plant reckoned it was more like hundreds of thousands.